The Siemens DLO7135 Dot matrix LED is one amazing piece of optoelectronics. It’s billed as a 5×7 Dot Matrix Intelligent Display (r) with Memory/Decoder/Driver. Along with that memory, it’s got a 96-character ASCII display set with upper and lower case characters, a built-in character generator and multiplexer, four levels of light intensity, and it all runs on 5V. That’s a lot to live up to, and at $16 a pop, it definitely should. While spending half the day at my favorite local electronics shop I found a bin full of these for $1.50 a piece. I left the store with several. This instructable will show you how to connect to these dot matrix LED’s and display characters using an AVR-based Arduino. If you’ve read any of my previous guides, you may get the idea that I’m often in favor of the most parsimonious solution, and you wouldn’t be wrong, even if I do fall short of the goal from time to time. Therefore, I’ll also go another step in this instructable and show you how you can reduce the number of I/O ports needed to drive these big, honkin’ dot matrix LED’s. 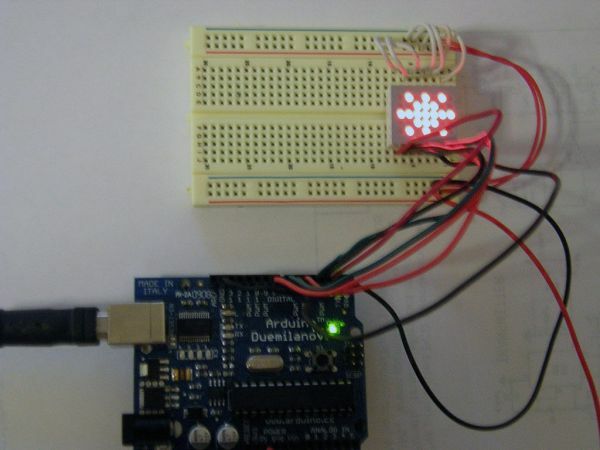 an AVR-based microcontroller like an Arduino or any of it’s ilk. These instructions could probably be adapted to your MCU of choice. hookup wire, wire cutters, etc. A soldering iron isn’t needed, although I use one later; you can get by without it. Lay out your small list of parts and grab the LED. Place it on the breadboard centered somewhat, straddling the midline groove. 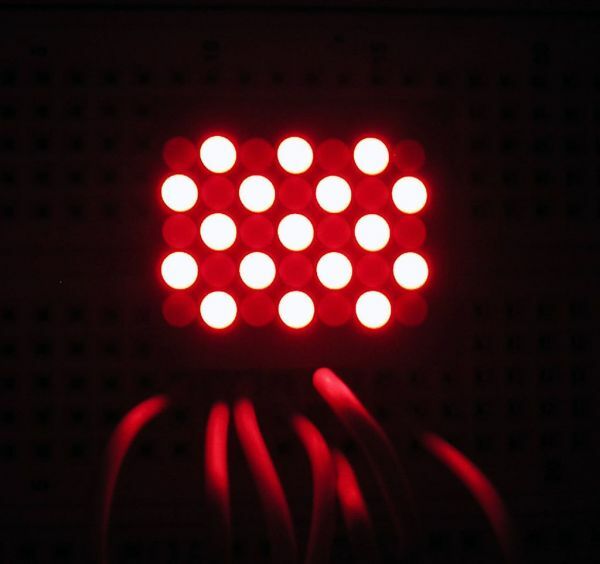 The first part of connecting takes place all on the left side of the LED. Pin #1 is located at the top left as indicated by the triangle/arrow. I put the pin functions on a picture for your reference as you’re reading or connecting up your LED. Starting at the top left, connect Vcc to 5V. It’s maybe a good idea to not have your board powered until you get the entire left side completed; the LED can be bright if you’re trying to see small holes to poke in wires. Connect the bottom left GND to ground. The 2nd and 3rd from the top on the left are Lamp Test and Chip Enable. These are both negative logic, meaning they are enabled when they are at a logical 0 instead of 1. My picture below should have bars over them, but I didn’t annotate that for any of them. The LT pin when enabled lights up every dot in the dot matrix at 1/7th brightness. It’s more of a pixel test, but the interesting thing about the LT pin is that it doesn’t overwrite any character that’s in the memory, so you if you have several of these strung together (they have a 20ft viewing distance), strobing LT can make it look like a cursor. To ensure it’s disabled, connect it to 5V. The CE and WR pins are also negative logic and are required to be enabled for this smart device to be written to. You could micromanage these pins with spare I/O ports on your microcontroller, but we won’t bother here. Just connect them to ground to keep them enabled. BL1 HIGH and BL0 LOW is 1/2 brightness. Both HIGH is full brightness. Set it to whatever you like. Again, if you have I/O ports to spare and it’s important enough to you, this can also be controlled by your Arduino. That wraps up the left side. If you bring power to your board you should see the LED light up. Play with the brightness controls and the lamp test to get familiar with it, if you’re curious. The right side consists of entirely data ports. The bottom right, pin 8 or D0 to be precise, represents the Least Significant Bit in the 7-bit character. The top right, pin 14 or D6 represents the Most Significant Bit. This lets you know what order to shuffle your bits when writing to the LED. When you have the data input ports wired up, find seven empty digital I/O ports on your Arduino or AVR and connect them. You’ll probably want to remember what data output port on your AVR goes to which data input port on the LED.